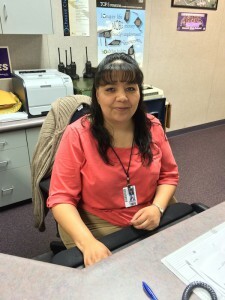 In her own very quiet, unique and very modest way, Marcy Montano has touched the lives of hundreds of Denair High School students over the past 13 years. Her job title may say “Administrative Assistant to the Principal,” but everyone knows her responsibilities and influence extend well beyond that. Need a Spanish speaker to help talk with a parent? Ask Marcy. Need someone to deftly coordinate multiple important tasks, all at once? See Marcy. Have a question about a policy or campus history? Marcy knows the answer. The school’s staff certainly appreciates Montano’s work ethic and value as a positive role model to students. They have recognized her as Denair’s School Bell Award winner for 2014. She joined other winners from Stanislaus County’s other school districts at a dinner Friday night in Modesto. School Bell Awards annually recognize educators who exemplify service to the community, enhancement of education and enrichment of the lives of children. Montano’s commitment to Denair High’s students includes quietly approaching staff members to financially assist teens to help pay for their senior trip to Disneyland or the cost of their cap and gown at graduation. She also recently organized an after-school workshop to help students learn how to create a resume so they could apply for jobs. Montano has been the go-to person for the past five high school principals and many on the staff. Stavrianoudakis called her “the hub” of Denair High’s wheel. In addition to the many day-to-day duties she performs so responsibly, Montano also has completed the coursework required to get her multiple subject teaching credential. All that is left is to pass the state tests. “I know this award usually goes to a teacher, so I’m very honored,” she said. Posted in News and tagged Denair High School, Marcy Montano, School Bell Award.